Warning: Racism Is Bad for Your Health. They also suggest that ways of minimizing social fear could be an effective way of reducing racism and other forms of prejudice. fMRI shows decrease in empathic responses to other races. July 2009. An observer feels more empathy for someone in pain when that person is in the same social group, according to a functional MRI (fMRI) study in the July 1 issue of the Journal of Neuroscience. The study shows that perceiving others in pain activates a part of the brain associated with empathy and emotion more if the observer and the observed are the same race. Stereotypes about African Americans can become self-fulfilling prophecies. By Dr. Monnica Williams, Ph.D. The term racism has evolved over time, for political reasons. Nonetheless, people who want to argue that racism is natural have tried to buttress their position with evidence that racism is in some sense biological. Are Students Afraid of Discussing Stereotypes? It seems that many students are so uncomfortable discussing sexist and racist stereotypes that they’d rather deny their existence. 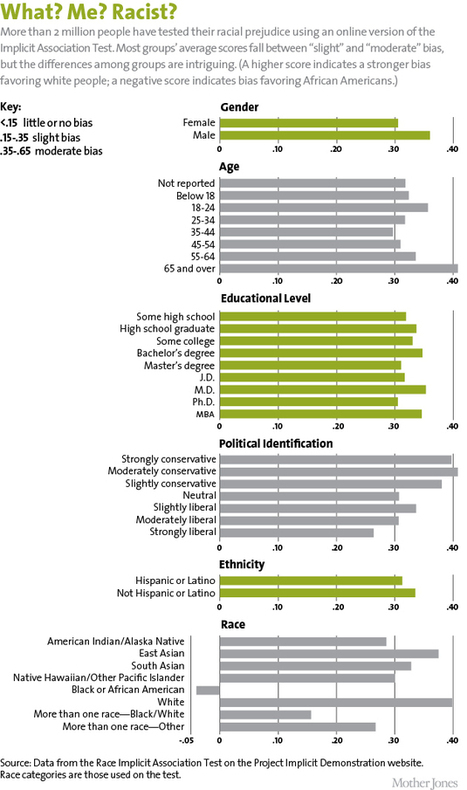 Most Americans think of prejudice as animosity toward people in other groups. But two psychologists argue that unconscious bias — often in the form of giving some people special treatment — is the way prejudice largely works in America today. Rodolfo Mendoza-Denton is an associate professor of psychology at UC Berkeley, and co-director of the UCB's Relationships and Social Cognition Laboratory. He studies prejudice, stigma, intergroup relations, cross-race-friendships and cultural psychology. He received his Ph.D. from Columbia University, and his B.A. from Yale University. A study has helped to identify that stereotyping can result in prejudice and this can, in turn, cause depression.